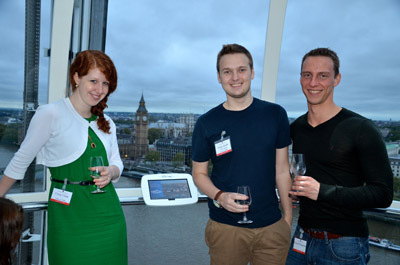 TASIS England alumni gathered for a special 'flight' on the London Eye on Thursday 10th May for a Vinopolis wine tasting experience. The sommelier from Vinopolis presented five wines for the group to taste. While onboard, Alumni met Headmaster Michael McBrien and his wife, Betsy. Alumni faculty member, Clive Ungless mingled and reconnected with many of the alumni he worked with while they attended school. The group was fortunate to have alumnae from the first graduating class, 1977 and the youngest alumni was from the class of 2007. Headmaster McBrien shared the new and exciting things happening on campus and how by participating in our annual fund, alumni can contribute to the learning experience of current and future students. If you live in the London area and would like to join us for alumni events in the city and on campus, contact the Alumni office or watch for news on the alumni section of the TASIS England website.